It seems as though the Midwest has been gripped in the icy jaws of a Polar Vortex all winter. Even those of us who grew up in Wisconsin and spent all of our lives here have learned this new phrase. Apparently a Polar Vortex is when the air is ripped from your lungs the second you walk outside because it is so cold. People do not say hello to neighbors; they walk with their heads down leaning into the bitter wind. Public schools will be holding classes well into June because we have cancelled school so many times this winter due to extreme cold. There are even rumors that Hell has frozen over. So here are some tips for surviving a Polar Vortex. 1. Laugh when the weather man says we could break the record for the most consecutive days of low temps below zero. (the record is 22 and we’re sitting at day 18). 2. Wear all of your hand knits all at once. It really doesn’t matter if your hat matches your scarf, mittens or wool socks. Just wear them. 3. Appreciate your stash. After all, wool has insulation value and you are just doing your part to keep your home warm. 5. Knit like the wind. After all, when you don’t want to be outside it’s a good way to fend off cabin fever. It seems as though I am very hard on my handknit mittens. I have three pairs of mittens and all have holes. I fixed my flip top mittens but those are really best for spring and fall when it’s not so bitterly cold. For the kind of weather we’ve been having you need mittens that can handle the cold and wind. 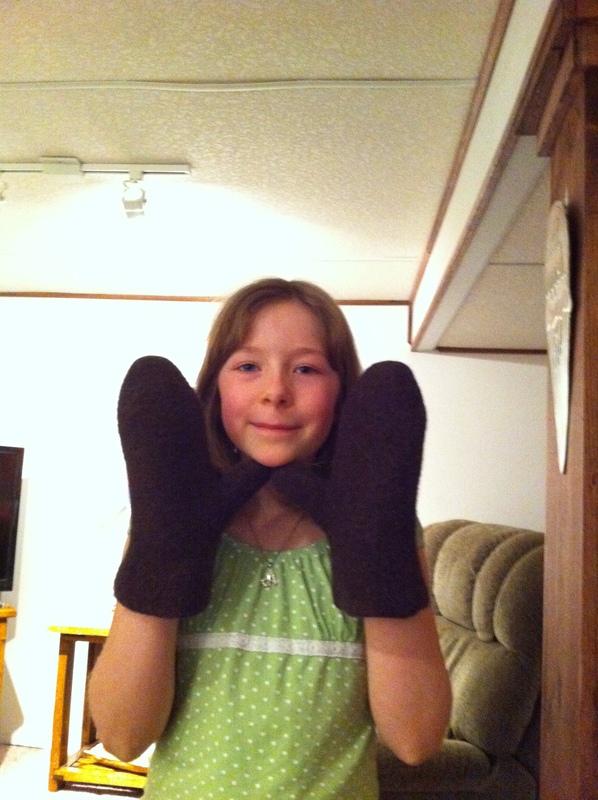 My lined Fiddlehead mittens fit the bill, but they’re definitely not rugged. Plus, the inside is unravelling on me. These have gotten serious wear and just wore out at the tips of the fingers. I’ll fix them, just not today. For serious Polar Vortex type winters, you need mittens that can handle ice, snow and wind. 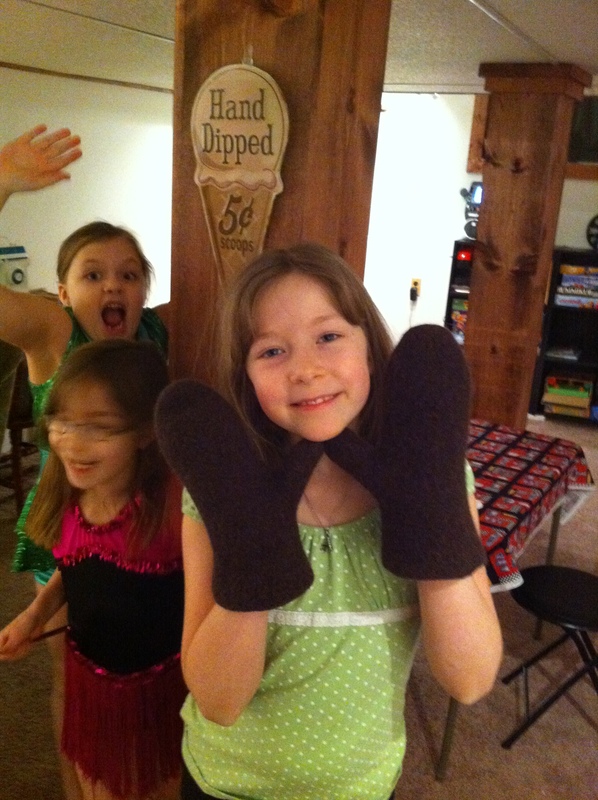 Felted mittens fit that bill. Yarn: Classic Elite Yarns Kumara (85%merino, 15% camel) for the mitten. Knitting My Way Home handspun (merino/silk blend) for the cuff. Modifications: None. I did a bit of research to make sure the Kumara would felt as camel does not felt. The percentage of merino was high enough that these took 2 cycles through my friends top loading washing machine. 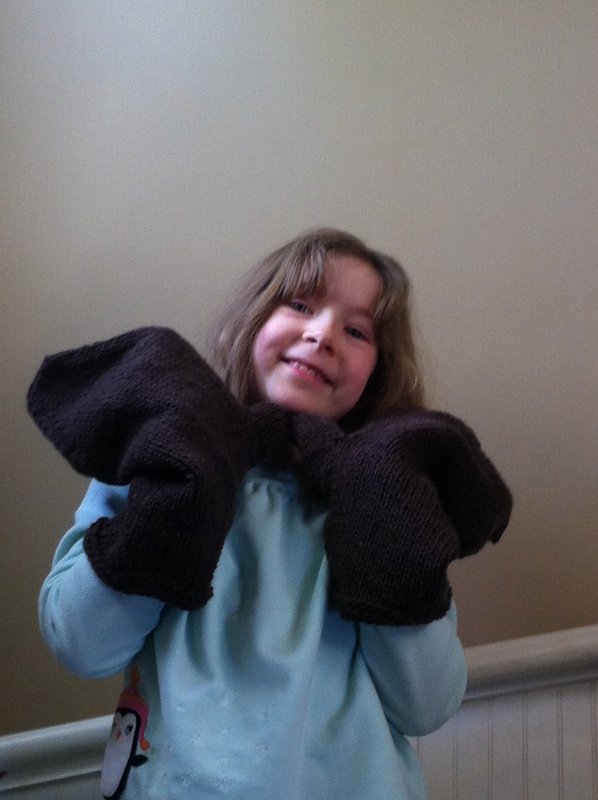 I love showing people the before and after photos of these mittens. Heck, I love everything about these mittens. They keep my hands warm on even the coldest days and I don’t have any problems driving in them. I have to point out that the kids are all in short sleeves! CRAZY! It must just be that our skin is craving to be out to possibly soak up a little vitamin D from windows when we are inside!